As I write this, the election is now less than a week away, with two entirely different paths possible for our future as we move toward 2013. These two approaches to energy are particularly different, but it is pointless to do any further comparison, since the airwaves have, on the rare occasion these differences are explored, discussed these from all points on the spectrum. Nevertheless, it gives an occasion to step aside from Iran, for a week, and to draw attention to something you may have missed in this debate, yet is starting to happen on university campuses scrambling to meet that ever-rising fuel bill. "Peak oilers have become almost extinct, destroyed by the arrival of new technologies with the U.S. leading the oil supply change," said David Hufton of oil brokerage PVM. Yet the very same week I received another newsletter from Go Haynesville Shale predicting (from Seeking Alpha) that 2013 will see the decline in Hanesville production. Now there are a variety of reasons for the decline, a significant one being that the number of wells drilled has fallen dramatically, as the article recognizes. But that is itself, in part, a recognition of the current economics of the business. I had a discussion this past week with the daughter of an investor who had “lost his shirt” over a natural gas well investment. The difference between the hype and the reality is disturbing, and does not bode well for a stable future. Which poses the question: What might the reality of that future be? I live in Missouri, and a number of years ago some of my colleagues evaluated the potential benefits of renewable energy and were left severely unimpressed with the potential for wind and solar in this state. At the time I was not sure what the answer was for our state. The campus where I worked until I retired, (Missouri University of Science and Technology – the new UMR) was quite revolutionary some decades ago in starting to burn wood with coal, as a way of controlling both emissions and costs. Now those benefits were disappearing, and the campus faced the prospect of finding about $25 million for a new boiler, at a time when state funds are not likely available, and what philanthropist wants to fund a boiler? So the campus had to be creative. And it was! Figure 2. 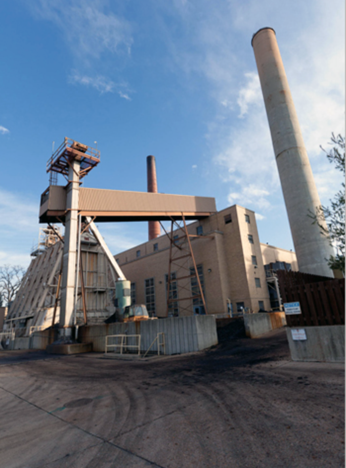 Old Campus Power Plant - the question of what to do with the stacks is unresolved. Beginning in the summer of 2010, the campus proposed the use of a ground-source heat pump system as a method of using the geothermal potential under the campus to lower the overall operating costs of generating power, while at the same time addressing issues regarding the generation of carbon dioxide, and the use of large volumes of water that are one of the costs of conventional coal-fired boiler use. The initial proposal was approved in remarkable time and over the past summer drilling crews moved in for the initial drilling of the wells. Unfortunately (but realistically) the greatest amount of open space around campus that can be used are the parking lots. And so a number of drilling rigs appeared as the students left for the summer, and proceeded to drill a series of roughly 600 wells, each around 400 ft deep. The last was completed last month, and the wells were then lined with piping and are currently being connected into a triad of networks. Figure 3. Simplified illustration of the geothermal circuit. Basically the system works on the idea that the ground, in depth, is at a relatively constant temperature. (For those of us who have mined in depth the old rule of thumb in the Northern UK was 60 deg at 60 ft and 1 degree rise per 60 ft thereafter – but the geothermal gradient varies around the world). Given this relatively consistent temperature, in winter the cool water (the blue line) can be pumped underground, heated and returned through the red line, from which it passes through a heat exchanger system that provides heat to the campus, while being returned via the blue line to repeat the process. In the summer the flow is reversed. 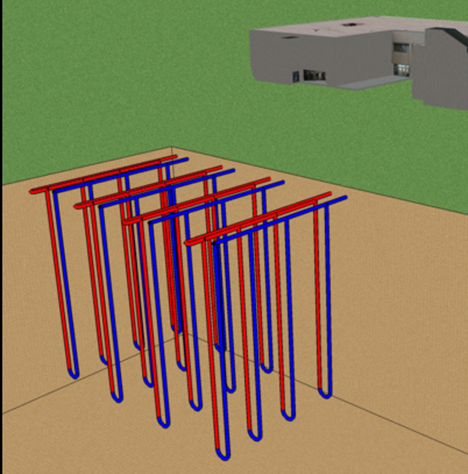 The hot water from the heat exchanger/chiller is returned to the wells through the red lines, releasing the heat into the ground and cooling before it returns back to the surface through the blue line, and into the chiller/heat exchanger to provide a cooling source for the campus. Current estimates are that the initial costs (paid for with a bond issue) will be no more than the cost of that boiler (which wasn’t going to be funded though needed), and that the campus will save, in the beginning, some $1 million in energy costs (the remaining energy will be supplied with natural gas and the boilers will be retired in 2014) and this will service the bond. The funds only allow some 60% of the campus to be initially served, through three separate plants that are set around the campus. In time, as savings mount, it is likely that other buildings will be brought into the loop (though some have sufficiently antiquated heating and cooling systems such that the entire building will need renovation first. Over the lifetime of the system (and there is not a lot of fragile equipment in the loop, so this may be more than fifty years) energy savings are likely to rise to more than $3 million a year, as the energy crisis that we are currently pretending isn’t happening finally comes to pass. Given the benefits that the system will develop, it is not surprising that MS&T are not alone in this approach. In fact, they learned of the concept at the time that Ball State was beginning their project. That project has just been dedicated and anticipates, being larger than ours, that it will save that campus around $2 million a year. It also includes some 3,600 wells by the time that the second phase of the program is completed. The idea is beginning to catch on, and there are a small but growing number of campuses now that are in the throes of the same type of effort, though in each case tailored to the individual needs of the different campuses. Hampton University in Virginia is heating their Multi-Purpose Building, Indiana Tech has restored and powered a Civil War era building, Montana Tech will use the heat from mine waters underneath the campus. In Boise, ID, the ground water temperature is a little higher (around 170 degrees) and the city has used geothermal energy since 1983, and now Boise State is joining in with its own plant. As with the Montana project, so the program at New Mexico Tech has also been funded as part of the Recovery Act. Some of the potential benefits of that program have been described by the Department of Energy. However that presentation also illustrates the transience of the funding opportunity. Given that drop in funding, it is still possible, given the savings projected not only here but elsewhere, that this technology may yet still catch on and become more widely adopted. I’ll keep you posted with more details, among other things. Could some readers share their own experiences installing these type systems? It's very dependent on local conditions. Here the main aquifer is 400 feet down (our well is 450'), so I would be very concerned about what kind of pipes you were using and what the heat exchange fluid was. Water, or glycol based? What corrosion inhibitors? etc, etc. The piping will either corrode (from inside or outside) or scale up. Leakage is inevitable, so maintenance has to be part of the plan. Like most things, it's more complicated than it appears. are made of PEX (polyethylene cross-linked). Fused joints - no leaks. There are some direct geoexchange systems that circulate refrigerant directly in the ground inside copper pipes in an attempt at a bit more efficiency, but those are rare AFAIK. but there one does get into fouling issues. The wiki claims 25 year life of the compressor unit, 50+ year life of the loop. NYSERDA has a nice paper on geoexchange systems. Another good resource is the Geoheat Center at the Oregon Institute of Technology, Klamath Falls, OR. They deal in direct use of hot water from the ground as well as ground source heat pumps. For residences, a loop field is often used instead of drilling. This is typically cheaper in areas that can be dug with an excavator and have sufficient space. A pit or series of trenches about 6 feet deep (2 m) is dug, loops of PEX are laid down, fused to a header, and it's backfilled with the removed spoil. I'm getting a system put in an older home in the Reno area, to replace an oil fired furnace. $27K all in (before any applicable rebates). 3.3 tons, 40KBTU/hr (I think that's 11.7 kW for the rest of the world). Oil heat can run several thousand dollars per season, and uh - the consensus on a site called theoildrum.com is that we're at/near peak oil, so I think it best to convert while there's a working economy. For those in the Reno area (or visiting) the Peppermill has a "real" geothermal system using hot water extracted from a well (and the cooled water is re-injected in another well). It now provides 100% of the heating needs of a rather large hotel/spa/casino. I was fortunate to go on a tour - interesting stuff. Some people in Reno live in the Moana geothermal district. Some have their own hot water wells, others are tied into a hot-water utility company, the Nevada Geothermal Utility Company. "Fused joints - no leaks." Sorry, I've seen fused joints (welds by another name) leak. Not by corrosion though. The joint is still a weak spot. And PEX has lousy heat transfer coefficient. So you must use a larger area so either or a small diameter or lots of extra length, and the last now requires a bigger pump. Or you can use a thinner wall, but now it's even more prone to leaks. That's engineering, it's always something. Before there can be benefits from improved insulation there still has to be some sort of system that supplies heat to the buildings. In this case the power, to date, comes from a coal:wood fired power plant that needs a new boiler. Rather than invest in that the money has been invested in the geothermal program. So a source of heat will exist. (Though the campus will still use some natural gas). Ground source heat pumps are more effective that air-source and the studies done on solar in Missouri haven't yet shown that it can be cost effective. Air-source heat pumps have gotten much better lately - they are mighty effective, and very cost effective for pretty much all of the US, and much of Canada. That probably works better for residential. Solar, too, is changing mighty fast. Germans are managing $2/Wp for installed costs for PV, which gives about $.10 per kWh (assuming 25 year life, and 7% interest). After living most of the last 43 years in Missouri I would say passive solar would be a problem, unless backed up by large heat storage. During the winter Missouri can have three or four cloudy days on a row when temps are 25 to 45 F. On air source heat pumps, they would work well here, although the temps occasionally get below 10 F at night, so they would be limited in capturing much heat occasionally. Heat pumps must have a refrigerant that can evaporate at below -10 or -20 F to capture heat at 10 F ambient. So these low temp systems would use more exotic refrigerant than 134a and have higher pressures. Certainly can be done but equipment cost is more.
. Missouri can have three or four cloudy days on a row when temps are 25 to 45 F.
That's nothin. Our house is sufficiently insulated that we don't turn on the heat until temps go below freezing. Pretty standard construction, but the windows are very, very efficient. I believe the latest air-source heat pumps can get a good COP well below 10 F. Hereinhalifax could tell you more about cost effective Canadian installations. Whoa! The article, however well-intended, confounds two very different technologies. 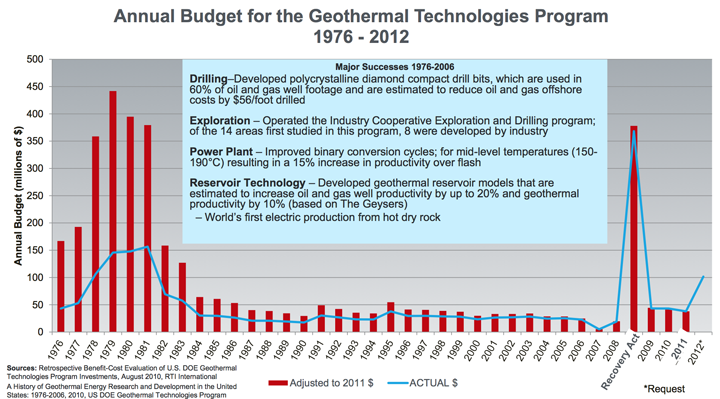 "Geothermal" in the sense of the DOE research program, almost exclusively deals with "hot rocks". It's about extracting true earth heat for direct use (heating buildings, etc) or indirect use (generating electricity). Mature technology, but very expensive (usually) because of the huge variability of stuff in the water brought up. Much of which likes to plate out and foul heat exchangers. We call this "Big G Geothermal". Most of the University installations (I think the first large one was probably Richard Stockton, in southern New Jersey, in the mid- to late- 80s) are a very different technology. They typically just use the earth as a heat sink/heat source for rather conventional unitary water-source heat pumps. The "loops" in the ground are made of high-density polyetheylene, or of PEX, and remarkably durable. Again, a relatively mature technology as an HVAC (heating, ventilating, and air-conditioning) system. Most popular for schools. Residential tends to be expensive, because of the expense of mobilizing a small drilling rig for just a couple of holes. This approach is very well understood, with a large literature and a fine environmental record. Its major challenge is controlling costs, particularly where inexperienced designers insist on belts, suspenders, and too many controls. There are decent design manuals available at ASHRAE.org. FWIW, I even did one myself for ASHRAE, on (something like "Geology and Drilling for Designers of Ground Source Heat Pump Systems. For obvious reasons, we prefer "Ground Source Heat Pump" to "Geothermal" for these, and refer to it as "little g" geothermal. I started with the idea of a efficient renovation but decided that if there are new homes being built I should just build new super efficient. Strawbale was too hard to convince the building inspector, and a worry about coastal damp. Cob is interesting but not enough insulation for real winters. We checked on 2 part foam, denim, wool, fiberglass, roxal and ended up with 12" staggered stud 2x4 blown in cellulose ~R40 walls and ~R100 attic to approach passivhaus standard. European windows (eg Optiwin )appear to be the only way to achieve high performance (apparently Canadians can't assemble wood & glass the same way, go figure). We have 150 tons of gravel annualized heat storage in our main slab on grade floor but since we are only on year one I have no idea how well that will work. We will probably end up with 2 evacuated glass thermal hot water panels to heat the house. With only one it seemed a little undersized but we also missed half the summer to get it working. An HRV with 50 meters of earth tube pre-heat has worked well - at -33 we were getting 8 degree inlet air. With a small super insulated house the geoexchange heat pump system start to look like expensive overkill. For 4 months this winter the heat ran at 2000 watts between -10 & -30, no heating needed above freezing if it is sunny every few days. I have purchased but not hooked up 2300 w solar PV - too busy getting the house liveable. Most of the effective 'features' were cheap - the windows were reasonable (the shipping wasn't), the two big heat sinks cost $1000 each and orienting the house to the sun was free. We have ended up with a 120m2 traditional looking farmhouse. The biogas generator is hiding in the greenhouse. I could generate some links but not on the iPhone! I am working on a design for a house of 1600sf, 150m^2 in Santa Cruz California. Temperature range is from -4 to 40ºC, 25 to 105ºF. It will have R26 walls,R40 in the ceiling, Solar thermal water heating, and PV. Although I could use an air sourced heat pump I could reduce the energy requirements for the compressor by about 30% using the 55º ground temperature rather than the 25º outside air temperature. I do not believe this 30% reduction would pay for bringing in a drill rig to bore a couple of 300 foot holes for the ground source heat exchanger, however I have approximately 850 feet of utility trenching to dig, so I was thinking of adding a loop of 2” PVC pipe to each of the utility trenches for a ground heat exchanger with about 1000 sf of surface area. Cost of the 1700 feet of PVC would be minimal, and the trenches are free. How deep are the trenches? Code minimum is 34 inches, however I am planning for 4 feet. Temperature at 1 foot only changes about 1ºC over a year at this location, so using a model with a soil cylinder of 1m as the storage zone surface temperature change should not have a measurable effect. Boise had geothermal heat for homes and businesses in 1892. Geothermal projects can and do go wrong, end up costing millions of dollars with a little to no benefit. Cost overruns make geothermal unworkable. Severely bends funding to the breaking point. Needs to be done like Boise did it way back when, a trip in Mr. Peabody's Wayback Machine helps. Nice try, though. Not quite, not hardly, not even. Go back and search for more oil. Wardpierce, the cost overruns at Minot State look like they are primarily due to how the project was bid out - I'm guessing also it was mainly cost plus contracting, which tends to be very profitable for contractors.I bet Minot did not incorporate penalty clauses for slow work either. In any event, it appears to have nothing to do with the technology. Remember, ground source heat pumping is a well proven technology, it is easily confused by the general public with deep steam geothermal power, which suffers from severe technological limitations. Two entirely different animals. I was involved in a billion dollar plus natural gas project that also ran into large cost overruns. The cost overruns were much, much, much larger than the Minot State project. Look up the Maritimes & Northeast project. Errors in business judgment turn up everywhere. Your argument did not convince me. Nice try though. Wardpierce, with many government projects you have “work rules, and prevailing wage” clauses that can limit who can do the work. In areas that do not have a large union workforce your options on the companies that are allowed to do the work are limited. Add to this a cost plus contract, and it can add a lot to the cost of the job, but if you want the “free” money you have to follow the funding sources rules. 1. dugouts- which, as the name implies, are homes dug out of an earthen formation- usually the side of a hill. Both constructions recognized the excellent temperature control properties of the earth in one of the harshest climates in the US. As energy declines and incomes fall, I wouldn't be surprised at all to see individuals and communities rediscovering the CHEAP thermal value of dirt. Grin, don't hold your breath. Back when the Energy Crisis hit in the '70's I had the same conclusion and spent a fair amount of time getting up to speed on underground buildings (of which there are quite a few in Missouri under such places as Kansas City and Springfield). There were international conferences and . . .and .. . . .it all went away. I still think it will come to pass one day, with a much greater development of underground space, but I no longer expect it in my lifetime. HO – Some years ago saw a TV report about a low temp geothermal project in Atlanta. I don’t recall the numbers but do remember it made great economic sense. Much simpler and cheaper than your project. A small water well rig an cheap (and non-corroding) flexible hoses u-tuber down several 300’ holes. Liquid exchangers sent the heat to the small nursing home under construction. Might not be practical for an individual home owner but I can imagine there would be tens of thousands of applications for small business. A lesson learned the hard way - Earth sheltering can greatly reduce the thermal gradient through the walls of a building, but those walls still need insulation, preferably between the wall and the earth! Back in the mid 70s my wife and I build an "earth sheltered" home in the Pacific Northwest. In that region the ground temperature is about 50F. Since we had failed to insulate the exterior of the concrete walls that were in contact with the surrounding earth those concrete walls tended to stay in equilibrium with the earth temperature. If the outside air temperature is 40 below zero, an interior temperature of 50 degrees can seem quite balmy. Some folks can live with interior temperatures that low, but since that was a little too cool for us, we ended up insulating the interior side of our concrete walls, which meant we lost all the thermal mass of the concrete. Insulating the interior was far easier than digging down through the earth to install foam on the exterior. What H.O. is referring to is underground or cave space. Several large ones exist in the Kansas City area. Years ago I had a project in one "cave" facility that a retailer used for warehousing. Constant 60 F and relative humidity of around 70 or 80% as I recall. These spaces were essentially rooms carved out of limestone at 50' to 100' below ground with "hallways" that you could drive a truck through and some had railroad tracks passing through them. No heat or cooling required in any of these except where offices were constructed (well insulated). Only problem I saw was when many trucks passed through the air was foul for a while. Sure saves on the energy bill, especially when Missouri had average high temp in July of around 100 deg. F this year. Aerated autoclaved concrete (AAC) is a good insulator plus has fairly good thermal mass. 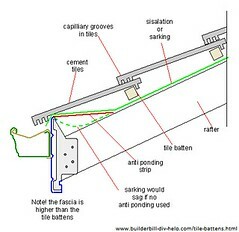 For basements I would use reinforced concrete for strength with a veneer of AAC facing the earth for insulation. My house on the Gulf Coast has 12 inch AAC walls that extend to two feet below grade. My floors stay near indoor temperature, but this is a very mild climate in winter. in finland (ground source) heat pump becomes more and more popular (also in sweden). in the north it's obviously nice that you get constant energy even if it is around -20 to -30 (celsius). the cooling in the summer is not so important... air source heat pumps are also popular: overall for the individual they can save money. however, they do not work when there's peak demand of energy in the winter, so they do not reduce the baseload when they should. In Nothern Europe district heating using hot water is the standard way of heating cities. In Göteborg, the second city of Sweden, the energy for the district heating of in principal the whole town comes from three sources- a waste burning plant, waste heat from two oil refinaries and from big heat pumps using the heat in the cleaned sewage water. Clearly the retrofitting option is not going to happen on a large scale. I note the irony of drilling the carpark. When heating fuel is too expensive the same may be true of driving to the campus. More generally the higher renewables future is going to need cheap energy to do things like drilling and concreting. That window for using cheap energy while you've got it must slowly close in decades to come. In other words if ground source heat pumping is barely economic now it will not get any more affordable. In the caption to Figure 4 I note the reference to electricity production from hot dry rock. That has been a major failure in Australia but that is a topic for another day. Wind and solar will only get cheaper. There are assumptions lurking in your statement. Modules are selling for what appears to be in some cases less than cost of manufacture due to oversupply. It appears that worldwide, dozens of manufacturers will go out of business to bring the market back into balance. Why must it be true that PV prices will ever even return to the the prices they are this year? How will the cost of eg tempered plate glass ever drop in the absence of truly cheap energy? (I bought some new polycrystaline panels this year for less than what I would pay just for the plate glass, actually).Granted, thin film tech may get cheaper, but it is already cheaper, and that is not what most of us are buying. Things don't always work out the way our mental models say they must. Modules are selling for what appears to be in some cases less than cost of manufacture due to oversupply. Absolutely. If supply & demand get back into balance pricing may not get back to this point for a while. Conversely, there was quite a while when prices were too high, due to an excess of demand over supply. Manufacturing costs will continue to fall - they always do. Energy is only a small % of manufacturing costs, and most is electricity which can come from many sources. Panel cost is now less important than Balance of System costs, which will continue to fall as things get integrated and installation gets more efficient. At the moment, wind power is larger and cheaper than solar, and wind will continue to get cheaper. To a point. Manufacturing cost reductions, from scale or technologic improvements, often follow a curve in which they fall rapidly for a while before flattening out. Absent a new breakthrough, it is possible that solar PV cost improvements flatten out and never reach grid parity. 2) OTOH efficency of cells increase. 20%-->22% until 2014 means 10% lower price per kWh. 3) PV-Modules will very likely change so that they become integral parts of buildings, they are not longer put on top of the roof, they become the roof. This aspect will save at least 15% with German prices of roof tiles etc. How hail-resistant are PV panels? Good enough for a roof? 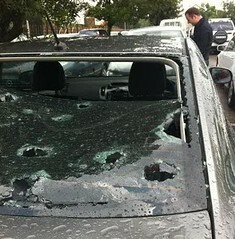 Johannesburg had hail that smashed car windows recently. We have some serious hail storms in Austria and southern Germany too, however, to my best of knowledge there is in most regions absolutely no problem to cover large PV installions with a insurance which costs less than 1% p.a. or to cover PV on houses with your houshold insurance. Therefore, my guess is that hail is not a real problem. Fair enough, but I was wondering if PV panels could replace roof tiles. If the panel was shattered by rain, you'd need to insure more than just the panel. You'd need to insure the ceiling and furniture against water damage, not to mention the inconvenience and trauma of having your home disrupted. Same argument goes for roof tiles but remember that the cells are embedded in 3 layers of plastic sheet. Tiles normally have some kind of felting behind as a waterproof layer, there is no reason why cells could not too. Okay, I see the problem doesn't arise with US roof construction. In the US roofs consist of a board decking covered in a membrane with tiles nailed to the board. So the tiles transmit any impact stress to the board underneath. They need to be tough but flexible. Our roofs consist of rigid tiles fixed to battens with a membrane underneath. The tiles need mechanical strength to resist impact. Clearly with the latter construction the PV panels need to be far stronger. In fact, such a roof probably can't be re-tiled with PV panels. The PV panel-only roof would have to be designed and built from scratch. Manufacturing cost reductions, from scale or technologic improvements, often follow a curve in which they fall rapidly for a while before flattening out. 1st, it's very unlikely we're at that point yet - PV is way too young, and there are probably hundreds of different chemistries, technical approaches and strategies in development. Some of those will find improvements. Heck, thin film and Chinese competition has wrung out cost reductions in "conventional" PV that no one expected just a few years ago. 2nd, manufacturing relentlessly grinds away improvements in labor productivity of about -5% per year, for even the oldest of products. That's why US manufacturing employment has fallen so much - when China joined the WTO US manufacturing plateaued in volume, and employment started to plummet. it is possible that solar PV cost improvements flatten out and never reach grid parity. It already has reached grid parity in some places. That will only increase. I agree - I think balance of system is most likely where there will be price improvement, I think we are seeing racking start to come down, thankfully, also the new high frequency inverters are cheaper to manufacture, I'm just not sure they have the same lifespan yet. And they don't really charge less for them at this point. Cost is a malleable thing, and so is the value of each currency - things that were cheap in real terms when I was younger are expensive now, and things that were expensive in real terms when I was younger are cheap now. Some of this is easy to predict, some isn't. Markets change in ways that cannot always be foreseen. I strongly suspect that for the preponderance of those now able to afford mono or poly PV panels, the dealing over the next few months is as good as it is likely to ever get, and taking into account the income stream from the electricity and the likely phasing out of the best incentives, will probably never be matched. Ah well. Another oversupply such as this one may happen, but the event that causes it might take the job that pays for the panels. Ironic. Its getting to be time to lay a few chips down if you have them, I think. Makes sense - at a certain point it's no longer worth waiting, and this looks like that point. Back before the days of gasoline/diesel ICE the wells were drilled with animal power and steam power (wood for boiler heat). I see that electric supplied drilling equipment could easily be run from wind/solar supplied grid. The only reason that diesel fuel is used for running drilling and earth moving equipment is because of the convenience. For stationary activities like well drilling, all machinery could be electric powered provided main transmission lines are close by. On another note, Bakken well drilling/fracturing/pumping is largely diesel powered. Diesel prices are among the highest in the nation in this area ($4.50/gal last month when I was in ND). But since oil and natural gas come out of the wells with no transport options for the gas, some drillers are burning the gas in small power plants and using some of the electric power on site. Perhaps in the near future most of the well equipment will be electric as one completed well powers the next one being drilled/fractured. I am only making a case for using limited amounts of electric power for stationary construction near electric power supply. This does not work for transport infrastructure work, except for electric railways to a limited degree. I suspect that for this to work longterm without supplementation, your cooling BTUs must be close to your heating BTUs, otherwise your underground temperature would start rising/falling depending upon the balance. Perhaps Missouri is in that climatic sweetspot where this is the case. For say Finland, I suspect you are extracting heat from your heat exchange area, and unless some other source is supplied (could be groundwater seepage, if that is fast enough), your underground temperature will drop until the system becomes ineffective. Of course you could deliberately "cool" the outside during summer to make up for this, but that would be an additional expense. In general, I suspect this is economically applicable for institution sized heating/cooling needs, but probably it doesn't scale down well to the size of a typical house. Actually I believe that there will be enough groundwater flow through the region that it will take away/add the out of balance heat so that the surrounding ground will remain largely at the same temperature all year. It will be interesting to see how true this is, and one of the things I want to check on is where they might have put thermocouples. I agree. The Earth's thermal mass tends to damp the fluctuations temperature which occur on the surface with a smaller variation with depth. At some depth, the temperature equals the yearly average temperature and as one digs deeper, the temperature is the average over a much longer time. That the temperature is around 55F at depth represents the average back to the Ice Ages, a period of 16 to 100 thousand years ago. The thermodynamics have allowed the temperature distribution versus depth has been used to reconstruct ancient surface temperatures using inversion models of the heat transfer properties of the material. a) there are still greater volumes surrounding the heat transfer volume, which damps the effect. b) its perfectly possible to add active systems to make up for the difference. If more warming than cooling is needed, then you can use solar to store extra heat in the ground during the summer. If more cooling than warming, then you can radiate away heat during the winter. I will never find the reference but I saw a calculation that if more than 1 in 5 suburban houses in an average Canadian city install geoexchange heat pumps it will cool off the earth to the point that it becomes uneconomic. So that gives some sort of estimate. As mentioned, if there is a requirement for summer cooling the thermodynamics & economics work better. I suspect Colorado may be in the sweet spot, cold in winter & hot in summer. but probably it doesn't scale down well to the size of a typical house. in finland these systems are typically used for "typical" houses. there's no particular subsidy for installing them. since this is becoming more and more popular i would say that this proves that they scale down well. i have the impression that one hole in the ground (maybe 200m deep) is sufficient for one (small?) house, and this does not make the underground temperature fall even though there's no need for cooling in the summer. i have heard that it's best if there's rock on the ground (not uncommon in finland). probably heat conduction is good in this case, so the heat extracted is replaced sufficiently by conduction. for big buildings, apartment blocks etc i don't know if there are many such systems here because we usually use district heating for those. It depends on the quality of the ground of course, but usually you can calculate with 50 Watt per metre, so for a house (not that small :-)) with 6 kW heat demand you need around 120 meter, more is better. The most economic solution is usually a simple ground source heat pump, with quite good layout your worst case is 0°C for the heat source in winter, depth drilling (?) gives higher performnace for much higher price. My 150 sqm house has a 4kW GSHP and a 4kW wood stove. It gets down to -10C very occasionally here in the south of the UK and we're pretty comfortable when that happens - maybe an extra jumper! The house is not super-insulated, but it's better than most. We have 2 x 37m boreholes and the ground temp seems stable (4th year of operation). It's worth noting that most of the heat is supplied to the system by the sun warming the ground surface, so going deeper isn't always better IMHO. We needed a new oil boiler (plus a new chimney and a new oil tank) so some of the capital cost we could offset against that, but it wasn't exactly cheap even though I did all but the drilling myself (£9k-ish). No subsidy. The heat pump has a COP of about 3 including all the pumps, which is pretty good. Oil is about 6p/kWh here, and our GSHP costs about 4p/kWh. Plus there's no servicing costs. Didn't Tom "Do the Math" Whipple have quite a long post on this a while back? He was bearish, but mainly at the level of "can we replace all our heating/cooling with geothermal", IIRC. The article is talking about geo-exchange heat pumps, aka ground-source heat pumps, not geothermal. I wonder how this compares (and was it compared ?) to what the University of Texas at Austin has - combined cycle co-generation ? All of the electricity on the main campus is generated on site (minimal transmission & transforming losses - medium voltage < 1 mile) in a combined cycle plant they cobbled together (gas turbine feeds old boiler). The waste heat is used for heating in the winter (and dehumidification in the summer, 4 tube system). Absorption cooling provides some of the chilled water, conventional a/c the rest. The conventional a/c part could become geothermal heat pumps. This story, not to deliberately make a pun, simply does not hold water. I worked for two years selling pumps and air compressors for a Missouri well driller (Cullum and Brown of Kansas City) and if the 60 degrees at 60 feet plus one degree for each 60 feet after that held they would be pumping 93 degree water from 2000 feet, and they were not. They were pumping 60 degree static ground water from that depth. If the desired temperature in the buildings is 70 degrees and the ground temperature 60-66 degrees for a 450 foot deep well, the heat transfer is simply not going to take place. Heat transfer requires a temperature differential to take place, and four to ten degrees is simply not going to make that happen. You might get some slight cooling from that depth in summer, but you are not going to get any significant heating in winter. Somebody is writing fiction here. JH, the magic is found in the heat pump. An air source heat pump is marginally beneficial as low as maybe 20F (sorry, I'm not very good with archaic units). A ΔT of a few degrees like 65=>70 for a ground source heat pump is a license to print money, once the infrastructure is done. bryan - Good point. Folks also need to grasp the difference between heat and temperature. A match head can be 600F but it won't warm your house up. But a 50F liquid heat source could supply thousands of BTU's in a short period of time if the heat (not the temp) is extracted. I understand the difference between heat and temperature very well. A -200F liquid could "still provide plenty of heat" all the way down to absolute zero, but it would cost a lot to extract that heat because you will have to use energy to do us, typically compression and expansion. The point of the article is using the "heat sink" of the ground without the need for energy input other than that required to pump the coolant. With a difference between the 70 degrees you want the building to be and the 60-66 gegrees of the heat sink, you only have 4-10 degrees of differential, and the heat transfer is going to be very inefficient. Even if you take summer temps in Missouri in the 80-90 range, you have only a 30 degree difference. Heat transfer in nuclear steam generators where the "delta T" is in thousands of degrees is only about 40% efficient, so with the paltry 10-30 degrees you have here? Coolant transfer is therefor going to be have to be very massive and the cost of pumping it alone is going to be costly as hell. You aren't going to use plastic piping for this; has anyone checked the thermal coefficient of plastic? So you are going to have either horrendously expemnsive corrosion resistant material and/or corrision problems and maintenance cost. Not to mention that, having sold those monster pumps, I can tell you they cost money to run and even more money to maintain. That's cooling in summer. When heating in winter even if you got the system to equilibrium your buildings would be 64 degrees at best, which is not ideal living conditions, and you'd never come close to achieving that so you'd have living quarters at some 50 degrees or so and students would go elsewhere. JH - A nuclear steam generator must provide motive force for an electric turbine and is constrained thermodynamically in a completely different way than the technology required for the heating of a building. Your comparison is inappropriate. The technology of heat pumps cannot be used cost effectively at this time for large scale electric generation and is iffy for small scale power. It is very well proven and widely available for home heating, which requires a much smaller delta T. Please read the Dept. of Energy document I linked - it is straight forward. "The point of the article is using the "heat sink" of the ground without the need for energy input other than that required to pump the coolant. With a difference between the 70 degrees you want the building to be and the 60-66 gegrees of the heat sink, you only have 4-10 degrees of differential, and the heat transfer is going to be very inefficient"
That's how heat pumps work, you only need to run the pump. You are pulling heat from a large heat reservoir of say 10 degrees C and then running it through a thermodynamic cycle to dump it in a building at say 30 degrees C.
We just built a little system for an aquarium on the west coast that uses the sea water being continuously pumped through the exhibits as a source of heat. It is 10 degrees C and we have the water collect in a big concrete tank before flowing back out to the beach, and in here we have our heat exchangers that take alcohol coolant from the HVAC at about 0 degrees C and absorb the heat from the water, to heat the building. Search for Tom Murphy's recent piece on heat pumps. The point of the article is using the "heat sink" of the ground without the need for energy input other than that required to pump the coolant. That's not correct - the system will use grid electricity to run the heat pump. The article isn't quite clear on this point. I'd be curious to see a short analysis. Coal is normally cheaper per BTU than electricity, even with a pretty high COP, so I would guess that the University must be getting pretty cheap electricity. "With a difference between the 70 degrees you want the building to be and the 60-66 gegrees of the heat sink, you only have 4-10 degrees of differential, and the heat transfer is going to be very inefficient. Even if you take summer temps in Missouri in the 80-90 range, you have only a 30 degree difference. Heat transfer in nuclear steam generators where the "delta T" is in thousands of degrees is only about 40% efficient, so with the paltry 10-30 degrees you have here?" That's why we couple this system to a "heat pump". I'd rather cool my house in summer by dumping energy into 70 degree rock or water vs. 110 degree air. You're still pushing the stone up the hill, the hill's just alot less steep, no? You still need external energy in most cases, just a lot less of it. Alternatively, when you're heating, much better to be using 50 degree rock or water as your starting point than -20 degree air, isn't it? four to ten degrees is simply not going to make that happen. they say that typically 200m well produces 35000 kWh/year (corresponding to about 4000 litres of heating oil). they don't say directly how warm it is underground. but the liquid (30% bioethanol, 70% water) is about +1 celsius when it comes up and after the heat exchange it goes down about -2 celsius. JH, moving heat is much more effective than creating it by electrical resistance. 1 unit of electric energy can move about 3.5 units of heat energy or more into a home via a refrigeration cycle. An air source heat pump can work effectively and to your advantage when outside air is -10F or colder with some avail. units. The tech is widely and easily available, and will be prevalent within a few years as it provides cheap reliable heat. It can beat burning wood! Here is a link to the US Dept of Energy National Renewable Energy Laboratory's test report on a couple units. Prices are easy to research on Amazon and eBay. You will be surprised how affordable the technology is. Edit: In case it is not clear to you, an air source heat pump uses the outside air as the heat source, no digging or drilling required. Look at the power one of the inverter air source heat pumps will draw,compare the BTUs produced with the BTUs produced by an power power standard electric heater. The heat pump gives you about triple the heat - it is like dividing your electric rate by three. If you are not comfortable with the physics it is like a gift from God. The ground source pumps tend to be more efficient due to the stability of the ground temp, and tend to last longer as they are subject to less thermal variation, but only make economic sense for new construction IMO, as the air source pumps now work well in most climates. Seagatherer wrote "...but only make economic sense for new construction IMO, as the air source pumps now work well in most climates." I think HO quoted 60 degrees at 60 ft and 1 deg rise per 60 ft of extra depth for northern UK, the place of his childhood, not for Missouri. I'm a physicist, not a geologist, but I'm sure the numbers are different in different places. What HO quoted is surely not a constant of nature, like the mass of an hydrogen atom, or even a constant of geology like the mass of the Earth. I'm sure he is aware of this regional variation, which is no doubt why he took care to note where his number came from. For every geological province, there is both and upward flow of heat from the core of the planet and an oscillatory flow of heat from above with an annual period. ( I suppose there is also an oscillatory flow with a repetition frequency of the ice ages. But I doubt there strong observational evidence for this lower frequency temperature signal ;-/ ) The wells on the campus where he had worked before retirement are, he said, 400 ft deep. The data from northern UK is not wildly inconsistent with what seems to be happening at the campus. It is wildly inconsistent with some small regions around Boise, and Reno. But geology is an applied science, not given to grand universal theories that earn Nobel Prizes. Thanks, HO for an interesting and optimistic post. Optimistic because it points out a way that there can be refugia for BAU for some people in some places. Okay, my apologies if this is a bit too far off topic. But I came across a ground-based compressed-gas energy storage technology today I hadn't heard of before, and was wondering if any one here had. The company is LightSail, out of Berkeley CA. The idea of using compressed gas for energy storage isn't new, but in the past has bumped up against the problem of -- as I misunderstand it -- how to efficiently compress and decompress the working fluid adiabatically. LightSail attempts to solve the problem by keeping the gas (air) nearly in thermal equilibrium with one or more water reservoirs. Which seems blindingly obvious once one thinks of it, so am wondering what anyone here might think of it? MM - I see the connection you made - thought you were plugging for the company there for a minute! No SG, I'm not flogging LightSail. What I am is perpetually haunted by Nate Hagen's The Fake Fire Brigade series from a few years back, combined with this country's refusal to get a grip on nukes. As it is, we appear bound and determined to break 1000 ppm CO2 by the end of the century. I keep hoping there's a way out, and am grasping at straws. It was a good series. It made its mark on me also. A way out - this election week has me thinking of the flaws in our democracy - I wish that there was one long term, no dealing with reelection,then maybe our leaders would feel free to make the harder choices, within the rule of law,and take a longer view.I am no longer Democratic or Republican - too disappointed. Nukes are a tough subject - you work hard to rebuff junk or fake science, and the same bad cites get thrown at you the next day by the same people - sometimes I think they have to know, and I start thinking about the psychology of it all, the Cold War we lived through, where we never, and still don't have a vote on nuclear weapons, and I think of the public's conflation of the two technologies. I think of the lack of understanding of radiation physics and distrust of authority. Leadership, trains, modular reactors. Good building codes. Common sense and concern for our grandchildren. Some things that come to mind as necessary to effectively bridge the yawning abyss of hardship the next few decades will be. The most extraordinarily disciplined culture of safety I have ever experienced is the US nuclear power industry.If more people experienced it directly it would help. Yikes, be careful with your trust of authority and handing over longer terms without elections. You are making a big assumption that this "authority" has the best interests of the nation as a goal. While "democracy" in the US may be deeply flawed, it still attempts to achieve some form of political accountability to the public. That "authority" you refer to, that people "distrust", well it's a private bank that retains an unchecked monopoly on money issuance, and that offers no share opportunities to anyone except Wall Street banks. That bank owns the government and every other person or corporation via debt slavery. It has absolutely no interest in moving forward into the future sustainably. It's sole purpose is to extract as much wealth as possible from the middle class. If we give it free reign for 10 years without the facade of elections then it will destroy us all. That seems inevitable at this point regardless. Your Owner is the Federal Reserve. Null, my opinion is that Wall Street exerts undue influence upon the political system primarily through campaign finance. The straightforward solution is public funding of campaigns, but that reform would have to be passed by the politicians who have been purchased under the current system. Hard to see how that would happen. Let me add a bit more. If I were running for president I would need to raise an astounding amount of money. Those most able to provide it would be foolish not to receive assurances that their money was well spent. Their interests must be met or the money will not be given. They are businessmen. During my first term I must do my best to honor the agreement with my largest contributors. If I do not, these contributors will not take it lightly, and will work against my interests during re-election. So my best path is to quietly work in their behalf while avoiding any issues of substance in my communiques with the public. I know also that my political competitors are playing the same game, they must if they are to gain and remain in office. Now of course, if I were a contributor with deep pockets, I would extract the same promises from both the Democratic and Republican candidate. It only makes sense. Now spend some time reading up on the LIBOR scandal (begin with Google News)- it may take a few hours to begin to understand it - but keep at it until you understand that pensioners and retirees worldwide wave been bilked out of monstrous amounts of money, to the direct benefit of the world's largest banks, who together illegally set the LIBOR rate. Understand that the 2008 contributing banks are deeply involved. Ask yourself why they are getting off scott free while British and European banks are getting spanked? And who is responsible for enforcing our laws? The Justice Dept. and the Executive Branch of course. Do a little research while you are at it on John Corzine, what he has done, and why he is very important to the Dem Party. I am out of energy. I was a registered Democrat, now Independent. Ever wonder why so many people on both sides are so partisan? They are right and they know it - but they only have half the story. Neither party works in the interest of the general public, both are deeply corrupt - largely due to what is required of them for campaign finance. I can't imagine they chose to be this way - too many good people remaining on both sides - this is the result of slow changes brought about by the monetary pressure of campaigning over many decades. Don't be afraid of term limits, don't be afraid of extending a single term in order to balance the effectiveness of the Presidency. The executive must come up to speed and compete against unelected career bureaucrats etc., remember there are other checks within the system such as the power to impeach, the tripartite structure of the gov., etc. I see no hope without some structural adjustment. It has happened many times within the short life of the Republic. EG FDR died during his fourth term. For without change a catastrophe was inevitable. Yet adaptable as the Roman mind was to matters of warfare, it was resistant to any sudden change in political rule. So, as the Roman elite did, what it was bred to do, as they competed ruthlessly with one another for the highest positions and honours, they unwittingly tore apart the very structure they were sworn to protect. Wind and solar would work quite nicely - affordable, scalable, good E-ROI, etc, etc. The problem is political resistance from the FF industry. I think so. PV is very effective now for rural new homes where the cost of connection to the grid must be considered. Wind blends well with nuclear. "Wind blends well with nuclear." In what sense? Sure, nuclear plants can provide automatic load-following. But no where near as cheap, I'd hazard, as natural gas. Without having the numbers, I'd also guess that as long as one was going to the expense of building nuclear plants with the capacity to take up the becalmed slack of wind, it would then be more cost effective to forego the wind completely: uranium is cheap, and wind is not without environmental costs of its own. I'm somewhat reluctant to fault the fossil fuel industry much beyond their (perhaps not inconsiderable) support and promulgation of the AGW Denialist Movement. Hagen's Hypothesis is that reliable and predictable electric power is so essential to a successful/competitive business and industrial economy that any society that aspires to such as little choice but to go with the cheapest (in the short term sense) power technology that will provide it. wind is not without environmental costs of its own. A myth promulgated by the FF industry. I'm somewhat reluctant to fault the fossil fuel industry much beyond their (perhaps not inconsiderable) support and promulgation of the AGW Denialist Movement. Coal is more expensive than wind when you include pollution. Further, wind in the US is cheaper than coal generated electricity in Germany or Japan, so the "competitive edge" argument doesn't work. Wind has environment costs. Windmills and associated power lines detract from view. To some this is serious. And windmills kill bats and baby birds. That you may be willing to bear the environmental costs of windmills and power lines you never see, doesn't mean the impacted tourist industries are. Or the mother birds. Coal is astronomically more expensive when you include pollution. But it's always on and pollution is an external cost. Your point? And the entire world lives in the US, Germany, and Japan? power lines detract from view. The author of the story about the Colorado power line is having trouble not giggling as they write about the billionaire rancher protecting his view. Bats? Your source says: The general impact of wind turbines on the environment is likely far less than that of conventional power sources. The bat and bird kills are incredibly tiny. You're not really serious about that, are you? That makes coal a very expensive and highly subsidized power source. It would be far cheaper and more efficient to internalize those costs, and give local manufacturing a direct subsidy, such as an investment tax credit or somesuch. the entire world lives in the US, Germany, and Japan? I suspect we're mostly talking about public policy in the US, and Germany and Japan are some of the most competitive manufacturers. If we're dealing with a competitiveness argument, well, they're a big part of the competition. More importantly, they demonstrate that differences in electricity costs don't make a material difference in manufacturing competitiveness. Finally, wind power has substantial variance, but the cost of dealing with that is small. It's badly exaggerated by the competition. Which is why I chose that example. I do hope you are not suggesting Mr. Bacon to be less a conservationist for his wealth. Such accusation may cut both ways. The upshot, however, was that Bacon donated both Bianca and Trinchera ranches as conservation easements to the U.S. Fish and Wildlife Service, to among other things further protect them from future power lines. And the power companies gave up when they realised there was too little demand for solar electric. Just as serious as your original contention that wind's environmental cost is "A myth promulgated by the FF industry". Which is it? Oh quite. But good luck with that. Let us know how it works out for you. I suspect we're mostly talking about public policy in the US, and Germany and Japan are some of the most competitive manufacturers. If we're dealing with a competitiveness argument, well, they're a big part of the competition. Actually, no. The most competitive manufacturer is China. And public (energy) policy in the US is of no consequence if it cannot radically influence public policy throughout the world. The carbon problem is just too huge. More importantly, they demonstrate that differences in electricity costs don't make a material difference in manufacturing competitiveness. Tell that to the South Koreans and the Japanese. Ah. The "cost of dealing with that" is precisely what prompted my LightSail inquiry in the first place. Have you any specific references? I do hope you are not suggesting Mr. Bacon to be less a conservationist for his wealth. Not at all. NIMBYs come in all income levels. "Jerry Apker, head of the division's Ranching for Wildlife program....said Division of Wildlife experts suggest that transmission lines across Trinchera would "not cause any direct significant impact to any species. It's more aesthetic and visual impact," he said." Hmmm. If you're not sure, then I would guess that you've been reading a lot of anti-wind websites with very unrealistic information. Wind power does not have environmental impacts that are on a scale that is anywhere near that of fossil fuels. I'm not clear on your point. So, you agree that what I said is proper public policy, but you doubt the willingness of government to hand out subsidies? The most competitive manufacturer is China. Not because of energy costs, which are higher in China. It's because of a labor cost advantage (which is now evaporating) and currency manipulation. public (energy) policy in the US is of no consequence if it cannot radically influence public policy throughout the world. The carbon problem is just too huge. Ah. You feel that we should do nothing about Climate Change, unless everyone else does really dramatic things first? First, the US is well behind China and Europe in it's deployment of wind and solar power (in terms of market share), and secondly, Climate Change is far from the only pollution produced by coal. It's criteria emissions are very expensive, and we should throw in mountain top removal, long-term occupational health costs, and a myriad of other external costs paid by US citizens. I don't need to - they already know. Manufacturers in both countries deal with power costs that are substantially higher than in the US. wind power has substantial variance, but the cost of dealing with that is small. - Have you any specific references? First, you have to clear your mind of the implied assertion from the FF (and nuclear) industries that they don't have significant variance. For instance, this study investigates what constant power the combinations of 19 existing US wind farms spread over an area of 850 km x 850 km can provide with the same reliability as the average of US coal plants. They provide coal intermittency stats: five-year averages of scheduled shutdowns 6.5% of the year and unscheduled outages 6% of the year. 2nd, only a small % of a region's wind power would need to be transferred between regions in order to provide balancing, and possibly not as far as one might think. Sometimes it's just a matter of a number of sub-regions getting their power, on average, 100 miles from their west, rather than 100 miles from their east, and in effect you've transferred power from the western edge of the overall region to the eastern. 3rd, wind is non-dispatchable (from a certain point of view) and has signficant variance, but it's not that unpredictable - that makes integration into the grid much easier than otherwise. The Western Wind and Solar Integration Study offered a first look at how a significant amount of renewable energy could be integrated into the grid in the western US. It followed a study published in January on the impact of wind farms on the grid east of the Rockies (see this BrighterEnergy.org story). The Western study looks at the power system operated by the WestConnect group of utilities in the mountain and southwest states. This group includes Arizona Public Service, El Paso Electric Co., NV Energy, Public Service of New Mexico, Salt River Project, Tri-State Generation and Transmission Cooperative, Tucson Electric Power, Western Area Power Administration, and Xcel Energy. The research stated that were these utilities to generate 27% of their electricity from wind and solar sources across the Western Interconnection grid, it would cut carbon emissions by 25% to 45%. It could also decrease fuel and emissions costs by 40%, depending on the future prices of natural gas, the study claimed. The study called for better use of wind and solar forecasts by utilities, and pointed out that more efficient use of the current grid infrastructure would mean less new transmission systems need to be built." This is what could be done easily with the current grid. No DSM, no storage, very little additional transmission, etc, etc. They're looking at the planning needed for the medium-term. A grid of more than 35% renewables is so far off that analyzing it is just a waste of time for a utility working group (people who actually do this for a living). "This article presents answers to commonly asked questions concerning wind power. It begins by addressing the variability of wind and then discusses whether wind has capacity credit. The article addresses whether wind can stop blowing everywhere at once, the uncertainty of predicting wind generation, whether it is expensive to integrate wind power, the need for new transmission, and whether wind generation requires backup generation or dedicated energy storage. Finally, we discuss whether there is suffi cient system flexibility to incorporate wind generation, whether coal is better than wind because coal has greater capacity factors, and whether there is a limit to how much wind power can be incorporated into the grid." Studies usually find a cost of wind integration (up to very roughly 25% of market share) of around .2 to .2 cents per kWh. Not much. Again, they're looking at the planning needed for the medium-term. A grid of more than 35% renewables is so far off that analyzing it is just a waste of time for a utility working group (people who actually do this for a living). Thanks Nick, this was precisely the sort of information I was trolling for. Appearances notwithstanding, I haven't visited any anti-wind sites -- but thanks for the suggestion -- and avoid the few "Those renewable green meanies got it in for us ain't it awful" nuclear sites in favour of those who really just want to solve the energy and carbon problems. Wind power does not have environmental impacts that are on a scale that is anywhere near that of fossil fuels. No argument there. Its an important step from your original assertion that wind's environmental cost is "A myth promulgated by the FF industry." I actually voted for the ballot referendum allowing Xcel Energy modest rate hikes to cover 20% W&S when it came up eight years ago. Colorado's east slope is now a leading wind turbine manufacturing hub, but will be hit hard if the $22/MWhr Production Tax Credit is not extended. And it won't be extended without credible arguments in its defence. So, you agree that what I said is proper public policy, but you doubt the willingness of government to hand out subsidies? Yes. The problem with subsidies is that sooner or later you run out of other people's money. Which is why the PTC became an issue this past election, and why Kyoto and Copenhagen and Duban all failed. Not at all and that's not what I said. But if whatever we do is not something the rest of the world can emulate and profit from, then the only justification we have is reduced FF cost and dependence, as climate won't be impacted. It will make no climate difference whatsoever if the US decreases its electric energy carbon foot print by 30 or 35%. We must reduce our total carbon emissions by 80%, as must the rest of the world. And it must be done within the next 30 or 40 years. If the Wind and Solar industries and NREL are not looking past 35%, they aren't doing the job. And if the renewables we deploy in the US are not done in a way that may be modified to suit the needs and weather and geological conditions of the developing world, we may as well not do them at all. First, if subsidized the W&S industries need to justify increased US market share by showing how they may more efficiently reach the 80% carbon reduction requirement than, say, a staggered deployment of nuclear and gas. There is also the question of whether or when wind power becomes too much of a good thing. Secondly, why should we throw in external costs the rest of the world (outside Europe) cannot afford to recognize? Again, don't get me wrong: the EPA could shut down every coal mine in the country tomorrow and my only concerns would be adding a bit more thermal ballast to my freezer, and how to most efficiently displace miners to the tar sands of Canada. But for most of the world, the only criteria is how to get cheap (short term cheap) reliable electric power. It's not that they might not recognize climate change. Its that they simply cannot afford its mitigation. I will read your references. Thanks for the scrounge. The problem with subsidies is that sooner or later you run out of other people's money. Which is why the PTC became an issue this past election, and why Kyoto and Copenhagen and Duban all failed. There are plenty of very large subsidies that sail on forever - mortgages, depletion allowances, etc, etc. The PTC became an issue, and Climate Change conferences failed, because of the opposition of entrenched legacy industries, FF chiefly among them. The idea that renewables are more expensive than FF is simply FF industry misinformation. Almost every economist will tell you that taxes and subsidies that internalize external costs are a good idea. In the case of pollution, they'll tell you that taxes are the right thing, but that subsidies are far easier to pass politically. It will make no climate difference whatsoever if the US decreases its electric energy carbon foot print by 30 or 35%. Natural gas cannot be a long term solution. Wind is a long term solution - in some locations. It's environmental impact is largely due to the large amount of land, concrete and steel required for a relatively small, relatively undependable power source. Still, I think that the best solution will include some wind. Gas and nuclear power both provide inexpensive power, - the nuclear approval process is ridiculously expensive though. Wind consumes very little land - perhaps 1/2 acre per 1.6-3MW wind turbine - much less than other forms of generation, when you include fuel mining and the overall footprint of generating plants (nuclear plants can take up more than a square mile). Rooftop solar doesn't consume any land at all. Right now 60 acres per turbine is pretty standard (probably 1.6MW), for 37.5 acres/MW. Farmers have often gotten about $4K per 1.6MW turbine, which meant about $40K on a 640 acre farm. 10 turbines means they only lose 5 acres of productive farmland (less than 1%), and perhaps double their net income. That's huge money for a farmer. Farmers love wind power and in the US there is an enormous wind resource in farm areas. A nuclear plant, OTOH, encloses it's land for security reasons, so it's really unavailable for other uses. There are 525,000 operating oil wells in the US, and probably 10M abandoned or dry wells. There are 70,000 abandoned coal mines - shouldn't we include those somehow in space requirement calculations? Regarding the land use footprint of a nuclear power station, let's fire up Google Maps and take a peek at Sizewell on the UK Suffolk coast. The site contains the now-decommissioned Sizewell A, and an American style PWR, Sizewell B, about 1.2GWe (1200MWe), which has been running happily at about 90% load factor since 1995. The scale rulers on the map indicate that the site is pretty close to 1 sq km (100 hectares). Similarly, we can cruise over to Finland, and look at the Olkiluoto site, where reactor 3, also about 1200MWe is under construction. The area per GWe is very similar to that of Sizewell. So that's ONE (1) sq.km per performing GWe, close enough. We have to add the land used for mining and refining the uranium yellowcake. The Clinton Power Station is located near Clinton, Illinois, USA. The nuclear power station has a General Electric boiling water reactor on a 14,300 acres (57.9 km2) site with an adjacent 5,000 acres (20.2 km2) cooling reservoir, Clinton Lake. Due to inflation and cost overruns, Clinton's final construction cost exceeded $2.6 billion, leading the plant to produce some of the most expensive power in the Midwest. The power station began service on April 24, 1987 and is currently capable of generating 1,043 MW. The Clinton nuclear plant uses 20 acres per average MW, and a 3MW wind turbine on a 1/2 acre uses 1/2 acre per average MW. What makes you concerned about that in particular? The impact of mining? Have you ever seen any quantitative analysis of that? NREL's "Land-Use Requirements of Modern Wind Power Plants in the United States" http://www.nrel.gov/docs/fy09osti/45834.pdf states about 1000 hectares (about 3.86 square miles)severely impacted land per 1 GW actual wind production. This Westinghouse material here http://www.ap1000.westinghousenuclear.com/ap1000_ec.html on the AP1000 reactor of about 3-4 hectares site size per 1 GW actual plant production. Not an apples to apples comparison of course, just showing info is easy to find. I would take the AP1000 info as an indication of what is possible with the design rather than what necessarily will be done with each unit, but it can't be too far off. Uranium mining impact upon the land per BTU is far less than any other source of fuel. I bet you can turn up some documentation with little effort! - but if you think this statement is outrageous, let me know. I have seen documentation in the past, so I know it is out there. I think it will be the last thing I'll look for tonight though. I saw a uranium solution mine that was a few well heads out in the desert. It was remarkable how little there was to it. Oh, here's a picture of an abandoned one here, http://en.wikipedia.org/wiki/In-situ_leach it doesn't look to badly impacted - not like a coal mine for sure! Nick I doubt we're too far apart re this issue, or won't be given a bit of effort- just a matter of keeping abreast of info and filtering out bad science and propaganda, you as likely as good as I at it - but I think its a bit OT. I agree. Actually, I think we'd eventually agree that land & materials inputs aren't a problem for wind, solar or nuclear. and 0.7 ± 0.6 hectares/MW for temporary impact, or a total direct surface area disruption of about 1.0 ± 0.7 hectares/MW." I've had an earth coupled water-source heat pump since 1989. I just replaced the old Florida unit last December with much more efficient Water Furnace. With the new unit, my electricity costs have dropped by about half to around $110/ month. This is to power an all electric 1,700 sq ft modern cape cod with south facing window walls & a cathedral ceiling. Summer thermostat settings around 80f and winter 68f. Were I not renting out the master bedroom, I could probably reduce the costs to less than $100/month. When I connect the unit's desuperheater to my hot water tank, I will save significantly more.